A monument honoring Confederate Gen. Nathan Bedford Forrest in Selma, Ala., in 2011. 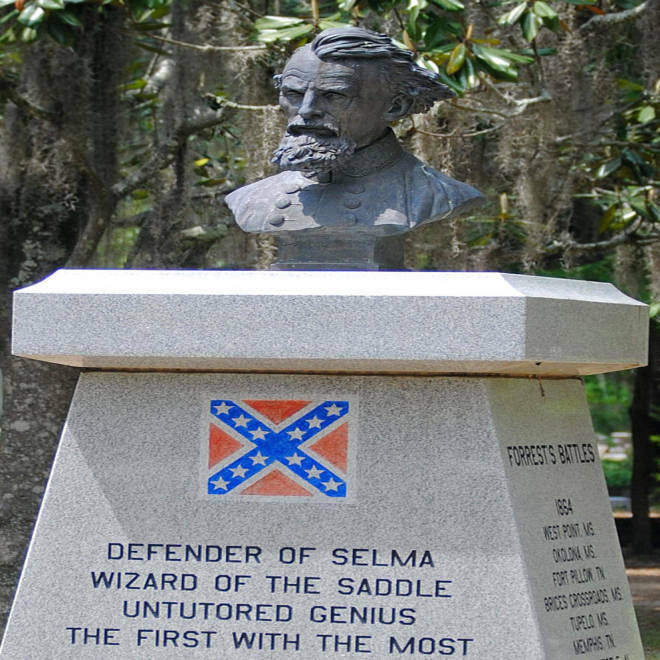 The renovation of a monument honoring a Civil War Confederate general, who was the first "Grand Wizard" of the Ku Klux Klan, is once more creating controversy in Selma, Ala., 11 years after protesters got it moved off of public property. The memorial is being repaired after the bust of Gen. Nathan Bedford Forrest was stolen in March from the 7-foot-tall granite monument it rested upon at a cemetery in Selma, reported The Birmingham News. A group known as the Friends of Forrest are replacing it, according to local media; and the United Daughters of the Confederacy are adding a pedestal and fencing to make it harder to steal, Selma City Council President Dr. Cecil Williamson told NBC News. "I would recommend this man (Forrest) for any young people to model his life after," Todd Kiscaden, of Friends of Forrest, told local NBC affiliate WSFA 12 News. "The man always led from the front. He did what he said he was going to do. He took care of his people, and his people included both races." Not everyone remembers the general that way. Though Forrest was one of the Confederacy’s better generals and their best cavalry leader, he was an “extreme racist,” Mark Pitcavage, an expert of military history and right-wing extremism at the Anti-Defamation League, told NBC News. Renovations on an Alabama monument honoring the Ku Klux Klan's founder has sparked outrage from critics who are pushing to stop the expansion. WSFA's Samuel King reports. Men under his command killed “in cold blood” 250 black soldiers fighting for the Union who were captured at Fort Pillow in Tennessee, Pitcavage said. “No one has ever proven conclusively that Forrest himself ordered it, but at the very least this was the sort of thing he was letting his men do,” he added. A federal congressional committee investigating the April 12, 1864, killings received testimony that as many as 200 black soldiers were slain after they surrendered at Fort Pillow. Forrest, a slave owner and a slave trader, was tapped to be the Ku Klux Klan’s first Grand Wizard – or supreme leader, the KKK’s highest position -- at a meeting in April 1867, according to Pitcavage and the Anti-Defamation League. “Although he was the titular head of the entire Ku Klux Klan, in practice he didn’t have much influence beyond Tennessee. It’s not like the Internet was there and he could give guidance to all of his followers across the country,” Pitcavage said. The Klan was “unbelievably violent,” killing many people and burning down schools and churches, leading Forrest to disband it in 1868 because the Grant administration decided to send federal troops to the South to maintain public order, Pitcavage said. “All he (Forrest) did was issue a formal order for appearance's sake, knowing that the Klan was not going to disappear and the Klan did not disappear. It continued full force for a number of years, but he was no longer officially its head after that point,” he said. The first monument to Forrest was put up on city property in October 2000 under the permission of the local government administration in power at the time. People dumped trashed on it and held a mock lynching, tying rope around it in protest, Williamson said. With a new mayor in office and “such a public outcry from parts of the community about it being on public property,” the city council voted to move it in 2001, he added. The new site is on an acre of land donated to the United Daughters of the Confederacy in 1877, said Williamson, adding that he believed the group was in control of the lot. NBC News’ efforts to reach the group for comment were not successful. But, Malika Sanders-Fortier, who described herself as a community leader in Selma, has started a petition calling for the city council to remove the monument. "Monuments celebrating violent racism and intolerance have no place in this country, let alone in a city like Selma, where the families of those attacked by the Klan still live," she wrote in her petition, which had collected more than 15,000 signatures as of Wednesday. But Williamson said it wasn't a city matter, noting the monument didn't belong to the local government, and that, as far as he knew, it was not on city property.